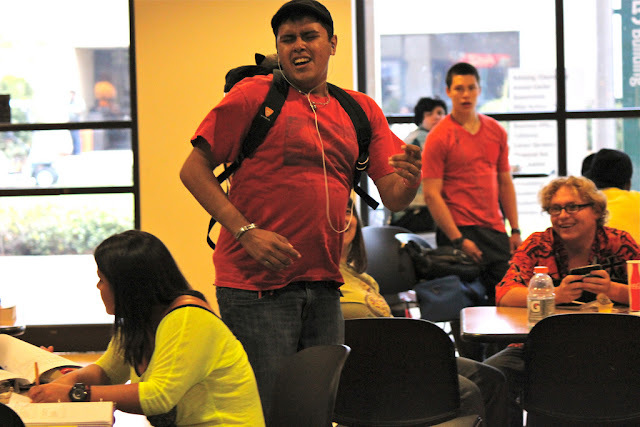 That question, among many others, were asked by students in the cafeteria at East Campus, as members of the Valencia Acting Gym performed a surprise live time loop routine. “We have no idea what's going to happen here,” said Valencia theater professor, John DiDonna. He organized this event, and has worked before on several other improvisational stunts with his acting students at Rollins College. Though it was a planned routine, students involved had to adapt to the situation and maintain any changes that occur if any outsiders get involved. Each of them played a different role that eventually becomes a wild 30 minute routine broken up into five minutes intervals that repeat six times. The routine is designed to start off slowly with most bystanders either oblivious or indifferent to what's happening. A few laughed and pointed at the students dressed as pirates and filming a video report about Benjamin Franklin. 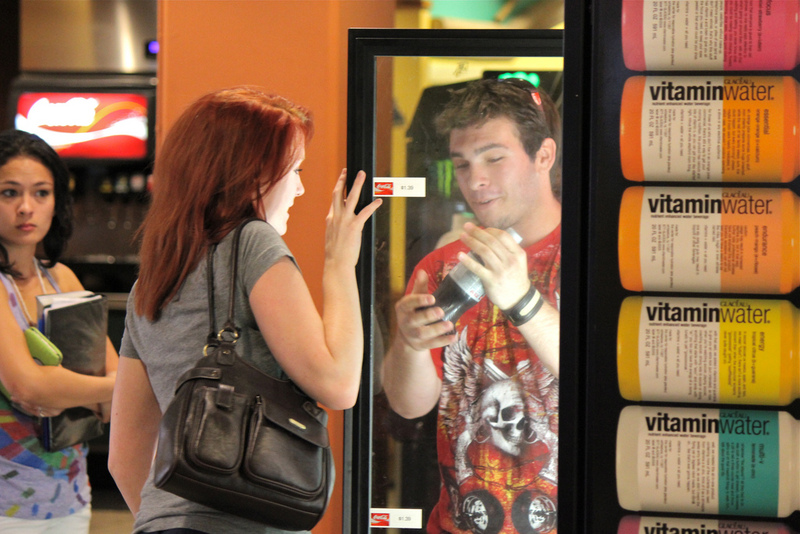 A couple also debated which soft drink to buy -- not out of the ordinary. When the same couple is seen talking about soda 20 minutes later, something is clearly out of the ordinary. This only helped to explain the same guy running into the room, jumping around and singing “I ain't no Hollaback Girl.” Cell phone cameras were out recording after the third dancing antic. Amused or angry, the full attention of the cafeteria was focused and confused by this brief buffoonery. Other wild moments like a bottle of water being spilled or a touchy guy getting slapped in the face highlighted the half-hour. With all the key moments timed to repeat and occur at different moments, the whole room became a display of zany creativity. They organize large public displays like people freezing in place at the mall, or dancing to “Thriller” by Michael Jackson. There are countless groups that stage and perform public routines across the nation; now Valencia College is no exception. The Valencia Acting Gym is described as an extra acting class that meets for a few hours on Saturday to allow acting students to work on the skills required for public performance. More information can be found at the group's Facebook page. Water caught mid-splash as several students look on at the commotion. 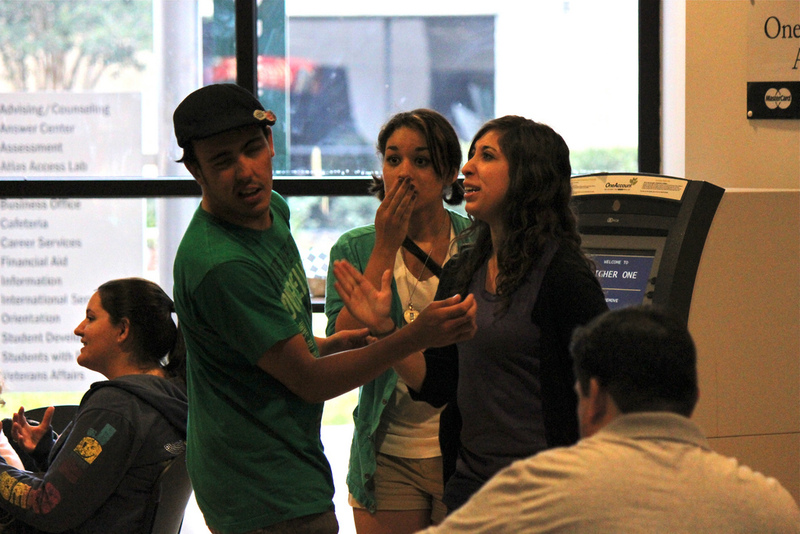 Acting Gym members debate of what type of drink to purchase as others wait to interrupt them. Caught just after a very real slap to the face after one group member gets a little touchy with another.